As our canine pals get older, they slow down and their needs change over time. Dogs reach what we consider to be old age at different times depending on breed – although smaller dogs reach maturity sooner than larger breeds, their life expectancy is longer. Other factors that affect how your dog ages include their environment and their diet. What happens when dogs age? While these are signs of old age, they can also be flags for certain illnesses, so if you notice any changes in your dog, take them to see a vet for advice. The main health issue older dogs suffer from is arthritis. Just like humans and other animals, dogs’ joints deteriorate with age, which can be connected to a dog being overweight. In some cases, a vet will be able to recommend medication for arthritis, but feeding them a high-quality dog food and taking them for regular exercise will also help. 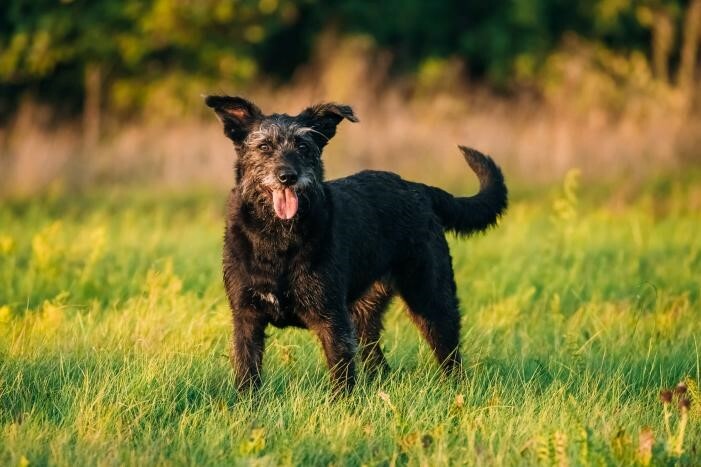 James Wellbeloved senior dog food is perfect for dogs aged seven and above, and contains a blend of taurine, glucosamine, chondroitin and herbs to help protect their heart and joints. It also contains extra vitamins C and E to support the older immune system, and lower levels of sodium and phosphorus to support the organs. Older dogs can also suffer from dementia as cognitive function decreases in old age. Symptoms include barking for no reason, appearing confused or disoriented, or going to the toilet indoors. There is no cure for canine dementia, but it can be helped with diet, medication and brain-training exercises. Unfortunately as dogs age, they also become more susceptible to more serious health problems such as heart disease, dental disease, kidney issues or cancer. If you notice your dog coughing or wheezing, drinking more and eating less, or find any lumps or bumps on their body, contact a vet straight away. Regularly checking your dog’s health will ensure that issues are picked up in good time. There are many ways you can support an older dog and ensure they are comfortable and content. Firstly, you should feed your senior dog the right food. Feeding them a specially formulated senior diet rich in nutrients and vitamins will help keep their health stays in tip-top condition, even in old age. As dogs get older they will require fewer calories, so you may need to reduce the amount you are feeding your dog and keep a careful eye on their weight. Remember to check the feeding guides on the bag of food when you change your dog to a senior diet. Next, continue to look after their health as normal, such as brushing their teeth and regularly taking them for vaccinations, flea and worming treatments. Older dogs can be more prone to dental problems and may need to be taken to the vet for treatment. Exercise for older dogs is still important, as it helps to maintain healthy joints and muscles. Some dogs can stay active well into their senior years, but if you notice your pet getting tired more easily, consider reducing the length of their walks slightly. You could also give your dog special toys to keep their brain stimulated, such as find-the-treat toys. Finally, do all you can to make sure your dog is comfortable. For example, if their joints are stiff, you can use ramps to help them with stairs. Older dogs may also prefer a softer bed with more blankets to cushion aches and pains. The most important factor when it comes to caring for an older dog is to continue to provide them with plenty of love and affection. Combined with regular vet check-ups and healthcare, your dog is sure to enjoy their twilight years as your faithful friend.